Other people can be given Diurn Guided Tour at RAMC. Come and meet the Royal Academy of Medicine of Catalonia. Located in one of the most important neoclassical buildings in Barcelona where the spectacular anatomical amphitheater built by Ventura Rodríguez stands out and was intended for the training of surgeons. The history of the Real Academy is linked to names like Pere Virgili, Antoni de Gimbernat or Santiago Ramón y Cajal. From the hand of our guides you will be able to know the building and its history, surely it will surprise you!. Languages: Catalan, Spanish, English, French, German, Chinese and Russian. To attend the "Diurn Guided Tours to the RAMC" will have to make the reservation and the payment. 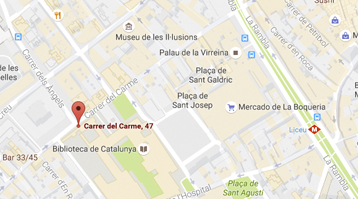 The visit to the Royal Academy of Medicine of Catalonia [RAMC] will not be cancel due to weather. They can give other people Diurn Guided visits to the Royal Academy of Medicine of Catalonia, gifts can choose the day they wish to enjoy the experience within the dates of the activity.